Artist rendering of Repellent Fence with view of single balloon. The scare-eye balloon is a curious invention. On one hand it is a pure consumer object intended to repel unwanted birds, but designed with embedded obsolescence. The balloons work for a day or so; then the birds return, and soon the balloons are covered with their feces. On the other hand, as an object-de-arte, the scare-eye balloons are beautiful and embedded with numerous layers of meaning. They purposefully, or inadvertently, employ indigenous medicine colors of the Western Hemisphere -- yellow, red, black and white. They also employ an iconography of oblong concentric circles known as the “open eye,” an iconography used by indigenous peoples ranging from South America to Canada for thousands of years. Together, the medicine colors, iconography and circular form constitute an indigenous semiotic system that demonstrates the interconnectedness of indigenous peoples throughout the Western Hemisphere, and provide long-form historical evidence of the cultural exchanges that have taken place through trade, intermarriage, migration and warfare. Regardless of the intentions behind the design of the scare-eye balloon, it is perhaps one of the most powerful indigenous readymades of our contemporary era. 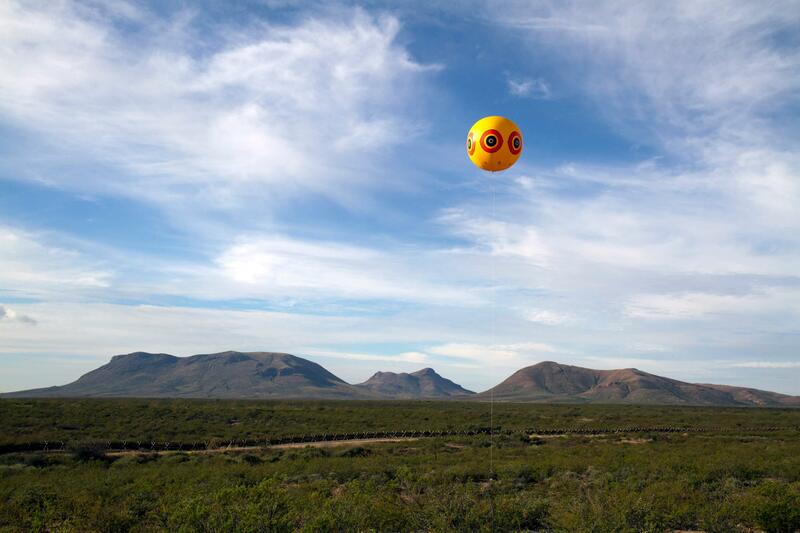 The idea was to build a temporary monument out of 10’ diameter replicas of scare-eye balloons, filled with helium and tethered to the earth in a manner that intersects the US/Mexico border. The goal was to create a monument of futility that mocks the concept of borders, particularly, their fortification, militarization and marginalization of peoples and cultures. Our hope was to facilitate public dialogue that specifically addressed the human and cultural violence instigated and perpetuated by borders as geopolitical implements that uproot cultures from their traditional homelands and divide indigenous communities.. The primary influence for our work was the Tohono O’odham experience: an Indigenous nation forcibly divided in half by the US/Mexico border --by political and economic forces well-beyond their control; forces entirely inconsiderate of indigenous peoples, worldviews, knowledge systems, cultures and sovereignty. Our goal was to raise awareness about social, cultural, political and economic indigenous issues that have been purposefully excluded from borderlands discourses. We wanted to remind the public about the fact that the immigrants crossing the border are not simply citizens of Mexico, Guatemala or El Salvador, for instance, but that they are first and foremost, indigenous peoples. We wanted to broker a conversation that respectfully acknowledges a fundamental premise: the US/Mexico “immigration crisis” is, in fact, a human rights crisis of the Western Hemisphere driven by irresponsible neoliberal trade practices, resource extraction, development, and labor practices of multinational corporations. Regardless of the intentions behind the design of the scare-eye balloon, it is perhaps one of the most powerful indigenous readymades of our contemporary era. 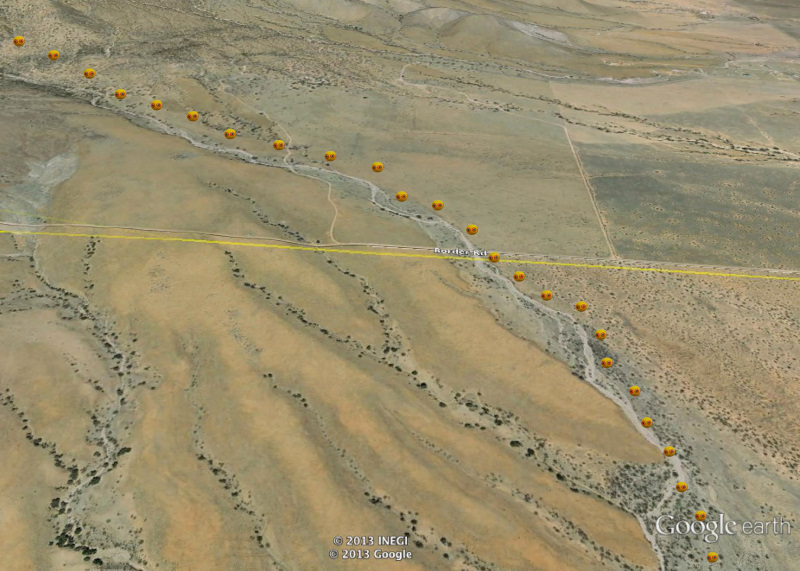 Artist rendering of Repellent Fence with aerial view. It has taken Postcommodity eight years to arrive at the implementation phase of the Repellent Fence. Essentially, we traveled throughout the Arizona/Sonora borderlands until we found a community with existing social policy goals seeking to enhance bi-national relationships that was seemingly waiting for a project like Repellent Fence to serve as a catalyst. During this time we encountered our fair share of obstacles. The harsh Sonoran Desert landscape and the brutal reach of the drug cartels were to be expected. But the complexity of negotiating the land and the cartels became a metaphysical process. It’s hard to tell which one – the land or the cartels -- exercises more power over the region. The process of getting to “know” the borderlands was a process of succumbing to the reality existing beneath ubiquitous surveillance. There are more cameras, sensing devices and mobile communication infrastructures riding on this landscape than any other part of the Western Hemisphere. There is no place to move, or retreat to, without being watched. On numerous occasions we had found ourselves to be the subjects of this surveillance system and the radio chatter of cartels, border patrol and federales. And even within this massive surveillance system we still encountered machine-gun totting vigilante groups, minutemen, militias and neo-Nazis appearing and disappearing amidst the desert cacti. We were informed by local ranch hands that one particular militia -- housed on a private ranch near the Coronado National Monument in Hereford, AZ -- were known to engage in military-style maneuvers to distract the border patrol away from the diligent efforts of cartel traffickers. Fortunately, we eventually found the people of Douglas, Arizona and Agua Prieta, Sonora, which are two small cities divided by the MEX/USA border, about 120 miles southeast of Tucson. Over the past two years we have had the opportunity to build relationships and engage the community around the Repellent Fence and the issues raised by the project. Ranchers, educators, entrepreneurs, government employees, artists, activists, religious leaders, NGOs, school districts, community colleges, arts institutions, US border patrol, and government leaders in the US and Mexico, have all responded positively to our work and have all played a generative role in co-determining the final form of the work, it’s location, and its essential meaning. In fact, the realization of this work is made possible through a Memorandum of Understanding between the two cities, which seeks to promote bi-national discourse and collaboration that enhances social and cultural interconnectedness and as well as regional economic development. What had originally been conceived of as a monument to futility has evolved into something much more substantial and meaningful: a bi-national suture, stitching the land and its communities back together for a moment in time. With the support of the people of Douglas and Agua Prieta we may now co-facilitate the creation of a shared community and metaphor,, capable of advancing self-determination against the backdrop of a deplorable human rights crisis. Learn more about 2012 grant recipient Postcommodity.